Red Drum, most commonly known as Redfish, are the main fish targeted by Fly Fish Rockport, and for good reason. 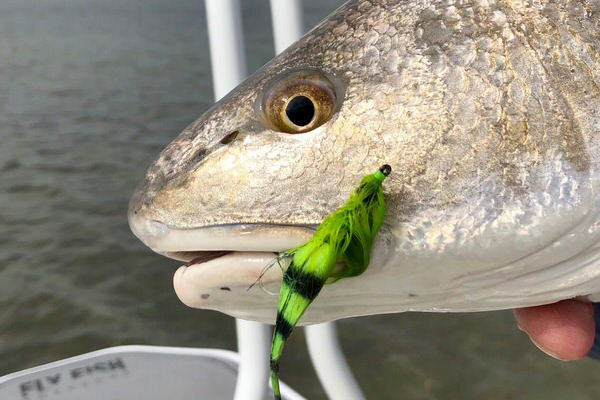 Searching the flats for these skittish yet feisty fish makes them a top choice for any angler looking to experience Texas saltwater fly fishing. Redfish get their name from their red colored upper body that gives way to a light colored, or white belly. These fish possess a streamlined body and a handsome silhouette, but are best known for the “eyespots” located near their tails. Most redfish have at least one spot on each side, some have many spots, and very rarely no spots at all. These spots are called “eyespots” because their intention is to confuse predators. What are other names for a Red Drum? Redfish, reds, spottails, red bass, and channel bass are a few other common names for these fish. The name “drum” comes from the drumming sound these fish can make when they are distressed. The World Record was caught in 1984 and was a whopping 94 lbs, 2 ounces… but you likely won’t find many of those. A 3 year old redfish is typically 6-8 lbs and the larger bull (male) mature redfish can reach 50 lbs. Redfish are also unique due to their longer lifespan; it is not unheard of for them to regularly live up to 60 years. Redfish can be found from Massachusetts to Key West, Florida… and then all the way along the gulf coast to Tuxpan, Mexico. 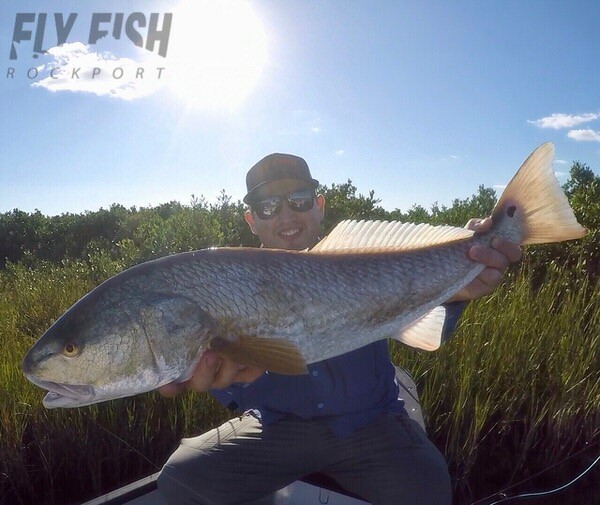 The area fished by Fly Fish Rockport is some of the best for finding consistent, year round numbers of redfish and includes the entire Coastal Bend of Texas. Redfish will spend their time in the marshes and estuaries, sometimes moving into water so shallow their backs will be showing as they work to find food. From a young maturity of 3-5 years on, they will move in and out of the shallower water surrounding bays, but also can be found around rocky outcroppings and man-made structures. These fish can be found over all types of ocean bottoms, but seem to prefer mud with vegetation. 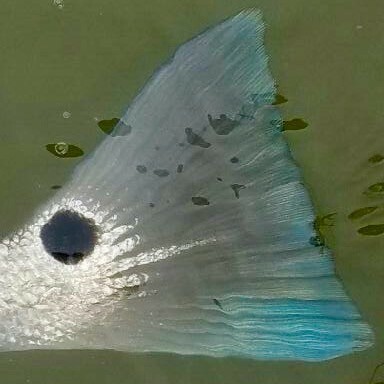 When the temperatures become too hot, or too cold, redfish will often move into deeper water where the water temperature can be more consistent. They can also move in and out of tidal rivers and waterways due to their ability to handle various levels of salinity. Redfish have a voracious appetite and their favorites include baitfish, crab, and shrimp. They frequently are looking down as they move along the bottom digging and searching for food, so anglers must be skilled at placing a fly correctly. Why are redfish one of the most sought after saltwater gamefish for light tackle and fly fishing anglers? Redfish are known for their excellent fighting ability and their voracious appetite, but one should not mistake this to mean that they will be easy to pursue. Their flighty nature, and the fact that they are frequently in very shallow, crystal clear water, makes catching them remarkably challenging; it is no wonder that they are one of the favorite species for Fly Fish Rockport.